Modern Landscape by Los Altos General Contractors Rich Mathers Construction, Inc.
Bamboo scares some people because its nature is to grow…a lot. In fact, some varieties of bamboo can grow up to three feet – in one day. Also, the running variety of bamboo is considered invasive with roots that grow like crazy to often take over your yard and the ones next to it. But – and there’s a big one coming – bamboo is one of the most beautiful, hardy, drought-and-pest-tolerant plants a homeowner can add to his yard. Many bamboo types make perfect privacy screens, hedges, and ornamental landscapes that are other plants find hard to mimic, as long as you keep some important things in mind with regard to maintenance and containment. Bamboo is a perennial evergreen in the grass family. More than 1,200 different species grow around the world. Various species grow to heights of 100 feet or more. Bamboo is also one of the most abundant plant resources on the planet. It grows new shoots without replanting and can be harvested within five years for building materials and other resources as opposed to most trees that can take up to 75 years to grow to a usable size. For landscaping purposes, it’s good to know that there are two main types of bamboo: running and clumping. Running bamboos are considered invasive because they spawn underground “runners” (called rhizomes) that extend away from the parent plant by large distances. Clumping bamboos produce a different type of underground rhizome that sprout new stems (culms) next to the original plant, which then expand slowly each year. 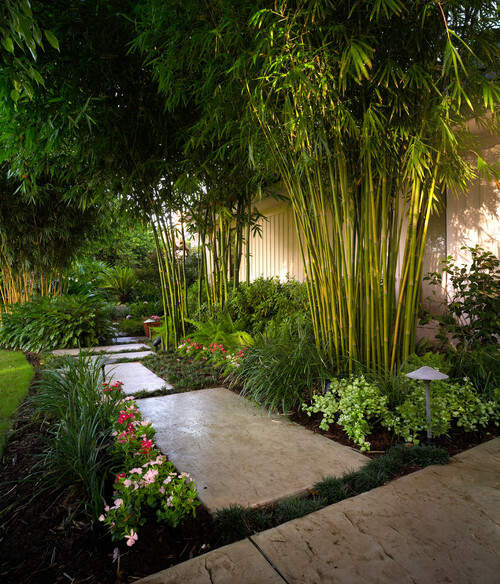 Clumping bamboo is most often used in landscaping because although like all bamboos it’s dense, fast growing, and prunable, it doesn’t encroach as easily into other yards, push up foundations or driveways, or require heavy digging equipment to remove if it grows out of control. Clumping bamboo also comes in upright and arching versions. Finally, bamboo grows up in the summer, and out (via new shoot production) in the spring and fall months. Bamboo tends to double in size every year. Bamboo lends visual interest and a striking design to a landscape given the dramatic height it can reach, as well as variation in leaf size, shape and color. Bamboo doesn’t need pesticides or fertilizers to grow and requires very little water as opposed to other plants. 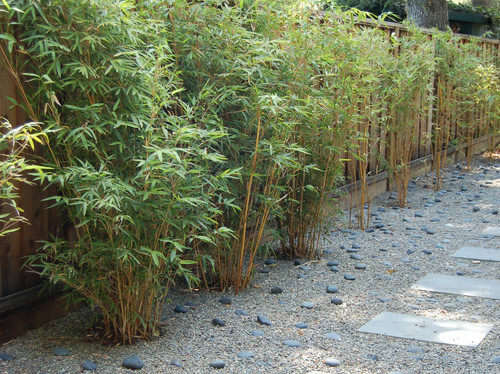 Bamboo comes in hundreds of varieties, and in varying heights and colors for any number of landscaping applications. Bamboo plants grow successfully in a range of climatic conditions. Bamboo is easy to grow. Probably the most common application in San Diego’s backyards, natural bamboo screens can be trimmed to desired heights and widths and grow quicker and taller than shrubs and hedges. Popular bamboo species used for this purpose include clumping varieties, Golden Bamboo and Dwarf Malay. The only drawback for landscape gardeners is that these clumping bamboo don’t grow as tall as the more invasive running bamboo. Although not as necessary in most of Southern California, wind breaks are often constructed using bamboo in many other parts of the world. Because bamboo is a flexible plant that can bend and sway in the strongest of winds, its use as a wind break is common in typhoon-prone areas and tropical locales experiencing heavy winds. However, fun fact: it’s been said that bamboo can offer refuge in the event of an earthquake due its ground-stabilizing root mass and low risk of falling branches. Bamboo also makes pretty hedges where privacy is not an issue. Opt for a more decorative landscaping appearance by maintaining the bamboo as a sheared hedge. Robusta is a good hedge bamboo because it reaches a height of 15 feet and is well suited for medium-high compact hedges. You can also prune this variety to keep it at lower heights if that’s the look you want. For smaller hedges, try Chishima Zasa. Several bamboo varieties reach maximum height of a few inches tall and are available in many beautiful colors, making them striking ground cover options. Keep in mind, that in “bamboo language,” ground cover bamboo varieties are those that grow under 10 feet. Ground covers can be used as focal points, for erosion control, or to cover challenging locations such as steep hillsides or banks. Popular ground cover options include Chino Elegant and Indocalamus Solidus. If the container is large enough for the bamboo variety you choose, container grown bamboo is another landscaping option, but will usually reach smaller heights than the ratings listed for the species. Containers submerged in the ground, placed on your patio or even grouped around your yard perimeter for a hedge effect. Slender Weavers or Temple Bamboo do quite well in containers. Environmentally friendly and durable bamboos are also used for patio furniture, fencing, edging, water features, and for ornamental areas such as zen gardens. Clumping bamboo is also ideal for defining areas in a large yard. If you want a wall between the pool and a children’s play area, bamboo is a nice choice and can even cut down on noise. Bamboo’s strength also lends itself to use as flooring, fencing, paneling, and wind chimes. Pound for pound, some species are as strong as steel, which makes this amazing grass very special indeed. Find out what size the bamboo’s mature clump will likely reach given the variety and growing conditions (i.e., varieties grown in containers may not reach the heights indicated). Also, some bamboos grow more upright than others and will assume less space at the same height. Many bamboo varieties grow well in subtropical and temperate zones, although some clumping bamboo species are much more cold tolerant than others. If you’re growing bamboo for a particular reason such as a privacy screen or ground cover, choose that after you know what size your yard can accommodate and if the growing conditions are optimum. Consider the species’ appearance be it color, leaf shape/size, arching or upright growing inclinations and denseness in growing patterns and how it all delivers the look you want. Although clumping bamboos don’t spread as far as running bamboo, they need a good amount of room as they grow. So first, choose a planting spot that allows for plenty of growing space. Most importantly at this stage, don’t plant bamboos too near to fences, foundations, walls, or property lines to accommodate annual growth and widening of the clump’s diameter. To achieve a hedge effect, plant a row of evenly spaced plants with the number of plants needed dependent on the size and species of the bamboo. Note that even if clumping bamboos can be grown in containers, they tend to stay healthier when allowed to grow free in soil. That’s because when the rhizome (or root) system grows too big for its container, the plant must be moved into a larger container and is even likely to break your pot eventually. Many clumping bamboos, in particular, the Bambusas, like full sun to partial shade and well drained soil. When planting, dig a hole slightly larger than the size of the root ball and then place it at or slightly lower than the soil level around the hole. Fill the hole with a mix of your ground soil and compost. Water thoroughly and mulch around the plant to conserve moisture. Water regularly because although bamboo don’t like to remain in standing water, they prefer consistent moisture in the first year of growth especially. Regular, deep waterings using a soaker hose or drip irrigation are best. After the first year, your bamboo should be established and relatively drought tolerant. Be on the lookout for symptoms of overwatering such as yellowing/spotting of leaves. Bamboo can survive without fertilizer, but it can make a difference in growth and appearance, so if you like, use composted manure in early spring and early fall. Bamboo loves nitrogen-rich fertilizers. In Southern California, palm fertilizers will work well for subtropical clumping bamboos. How often you prune depends on what you’re using the bamboo for (hedges, etc.) and personal preference. When removing canes, cut them as close to ground level as you can. For best growth, do not prune out more than one-third of the canes a year. Root pruning can help control the spread of rhizomes and is accomplished by working the soil around the bamboo with a sharp spade and removing errant rhizomes. A general rule of thumb is to root prune rhizomes to about two feet from the parent plant. This species has golden culms (bamboo stems) striped with green. This variety can grow as high as 30 feet and is often used for privacy screens. This bamboo type features bulging (“Buddha belly” culms and long, narrow green leaves, and can grow up to 50 feet. This type of bamboo forms dense clumps with lighter green, textured leaves and its lush top growth also make it ideal for privacy screens. It grows up to 13 feet in height. Compact and lush, this variety lends itself better to pot planting than other clumping species. Chinese Dwarf Bamboo is also a popular hedge choice and can grow up to nine feet tall. This clumping form of black bamboo has light green leaves and dark culms with lighter stripes. It grows upwards of 50 feet. Golden Goddess is another species preferred for privacy screens or to mark borders and perimeters. It grows to about 10 feet tall. To keep running bamboo from spreading to other parts of your property where you don’t want it to grow, you’ll need to install ground barriers. The best material for this purpose is high density polyethylene plastic measuring between 30-60 mils. This will allow the barrier to act as a root stop, and prevent rampant growth. Dig a trench dig a trench 8 to 12 inches wide by 12 inches deep around the perimeter of the area where you want to contain the bamboo. The trench’s depth should be 2″ less than the depth of the barrier. Insert the barrier into the trench and overlap by four feet where the two ends meet. Seal the seams vertically with double-sided tape to stop the rhizome from breaking through the seams. Make sure the top of the barrier remains 2″ above the soil. This will make it easier to cut the rhizomes back before they jump over the barrier. Angle the barrier away from the area that you are containing so rhizomes or new bamboo is not directed down and under the barrier. Pack the bottom of the trench with hard clay before filling with dirt. Once your barrier has been installed, monitor the area and clip away any young bamboo encroaching near the area. 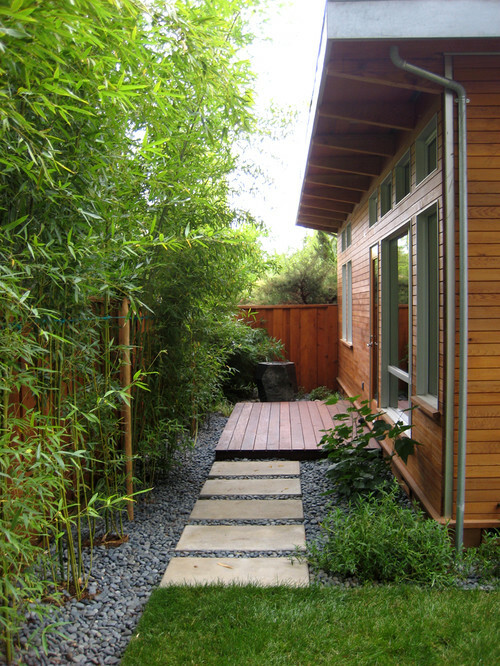 Bamboo is a gorgeous, functional, and eco-friendly addition to any yard. 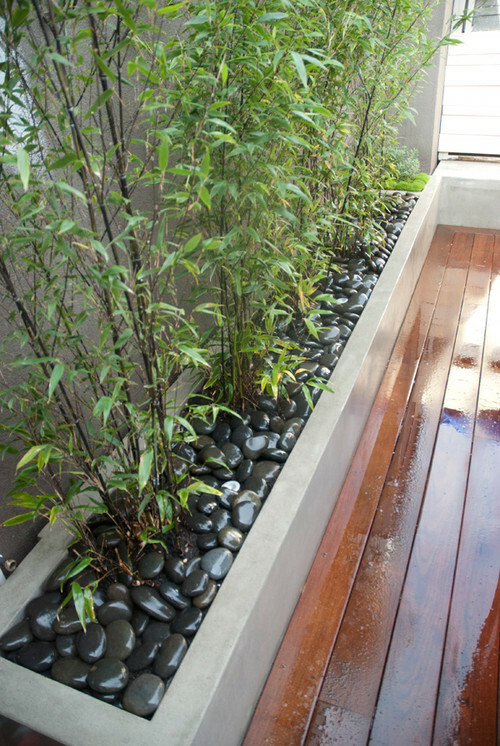 What’s been your experience with bamboo or are you considering adding it to your landscape? Photo credits: Houzz; when clicked images will lead to original links.